The French Republic has land borders with Belgium, Luxembourg, Germany, Switzerland, Italy, Monaco, Spain and Andorra. Its coastal borders are with the Mediterranean Sea, the Atlantic and the English Channel. Corsica is a French island in the Mediterranean. Other French territories include the islands of Guadeloupe and Martinique in the Caribbean, French Guiana in South America, Reunion in the Indian Ocean and French Polynesia, New Caledonia, and Wallis and Futuna in Oceania. Paris is the capital city. Other major cities are Lyon, Marseille, Nantes, Nice, Toulouse and Strasbourg. Much of France’s terrain is flat with hills in the north and west. Mountainous regions include the Pyrenees in the south and the Alps in the east. The Loire is France’s longest river. Other major rivers are the Dordogne, Garonne, Marne, Rhine, Rhone, Seine, and Somme. France’s climate is varied. Its winters are quite cool with mild summers. Winter and summer are much warmer along the Mediterranean. The landscape of France is varied. Forests and woodland areas cover over a quarter of the country. France also has over twenty sites on the Ramsar List of Wetlands of International Importance. Mount Perdu, in the Pyrenees, is a joint French and Spanish World Heritage site. The designated site consists of scenic landscape with meadows, lakes, caves and forests on mountain slopes. La Federation des Parcs Naturels Regionaux de France oversees France’s nature reserves which are home to many endangered plants and birds. Animals include small creatures such as foxes and deer; the chamois lives in alpine areas and some wild boar can still be found in the more remote forested areas. France has a diverse architectural heritage. It is particularly well known for Gothic churches built between the twelfth and fifteenth centuries: Notre Dame in Paris, Chartres Cathedral, Amiens Cathedral and the Benedictine Abbey, and Mont-Saint Michel. Carcassonne is an excellent example of a medieval walled city and Fougeres and Vitre are also noteable historic cities. During the Renaissance the palace at Fontainebleau was renovated and many of the famous chateaux of the Loire Valley constructed. 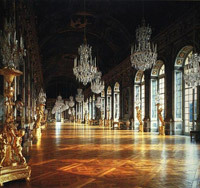 In the seventeenth century Louis XIV took a personal interest in building the palace at Versailles, outside Paris. 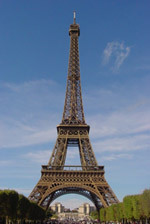 Buildings of interest in the capital include the Musee d’Orsay, the Pompidou Centre and, of course, the Eiffel Tower. France’s population was estimated at 64,057,790 in 2008. Ethnic minorities include North African and Indochinese people from the old French colonial empire. French is the official language. There are some regional dialects and languages such as Breton and Corsican. Over eighty percent of the French people are Roman Catholic. France is famous for its food: crepes, croissants, baguettes, Croque-Monsieur (toasted cheese and ham sandwich), regional cheeses, onion soup, cassoulet (stew), bouillabaisse (fish stew) and escargots aux grenouilles (snails with frogs’ legs). Of course, French food is extremely varied with each region having its own specialities. For example, Dijon is famous for mustard and mayonnaise originally came from the region of Mayenne. North African food is also available, introduced to France by migrant workers from the old colonies. Wines are named after their areas of production: Burgandy, Bordeaux and Champagne. Cassis, (blackcurrant liqueur) calvados (apple brandy) and cognac are also produced.